New Fortnite mode is about to release to ease the players into the season 5. Maybe easing the players isn’t the right phrase to use here. The new Fortnite Tactics Showdown LTM mode is revealed to the fans via a leak. This new mode claims to put the things on a new twist on Battle Royale. The mode may also set the pattern for the esports game yet to come. Definitely, players will like a new twist in the game. This new Fortnite mode will be a limited-time mode and will feature the survivability aspects of the game. The leaked noted of Fortnite patch 4.4 has also revealed the mode will stay around only a week. Fans can access the leaked notes on the internet. It has also revealed in the leak that players will have to play tactically in the combat. 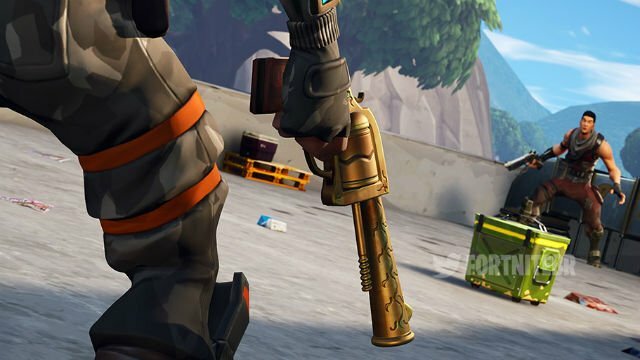 The new Fortnite mode will also restrict the use of ammunition the players can carry. The player-built structures will also have lesser health than usual. The eliminated players will also drop fewer resources than normal. Putting it in simpler words, the players will have lesser ammo and resources in this new Fortnite mode. This restriction is the specialty of this mode to make every shot count. Same goes for the lack of resources. To coup up with the mode players will ha to create the structures tactically in order to survive. As of now, there’s no exact release date of this mode. But with the new image is out not, we can assume that the mode may release in a few weeks. So, fans can expect the launch of the mode in late July or early August. The image below shows the first look of this mode. The two characters are standing in front of each other ready for combat.